I realize that people in general, and Americans in particular, have never been genteel when it comes to discourse. Throughout history we attributed it to our pride in rugged individualism and the Protestant work ethic. Anyone can be president; I can achieve anything I set my mind out to do; we celebrate Edison, Bell, Fulton, because those individuals invented things to change the world. We claimed territory, as our right under “Manifest Destiny,” without regard to who or what stood in our way. Passenger pigeons? Bison? Native Americans? Forests? These speed bumps were quickly removed. We settled our differences by swordfights or pistol duels. 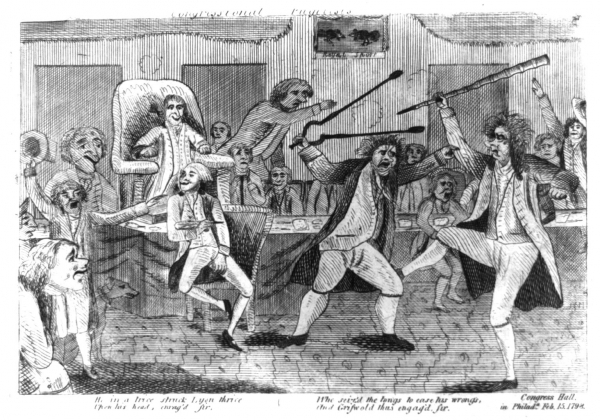 Our politicians—those we elected to represent us—settled arguments by shouting, spreading lies, and even bludgeoning one another with walking sticks in the very halls of Congress. Not much has changed. Today, if you disrespect me, there’s today’s version of a duel—I drive 60 miles per hour through the neighborhood blasting away and hope that you are one of the people I hit. It doesn’t matter that: a) the bullet most likely will hit someone other than the intended target, and b) there’s a high likelihood that one (or more) of the gazillion security cameras will catch me and be used to send me away for twenty-five-to-life. Although I just clearly stated my position (the paragraph above, you buffoon!) you can’t tell me what it is. I can’t either, but that doesn’t matter, does it? The fact remains that I’m right and you’re wrong. A theory—presented for you to think about and challenge in a professional, factual manner. Perhaps, when we began to focus on standardized testing, the school systems were forced to teach the correct answers, not how to arrive at a correct answer. What to think, not how to think. Ideas are no longer the raw material used for thinking; they are pre-packaged and ready to serve. No human interaction required. There are parallels—in a world in which our youth do not know how to interact with others except via social media, we no longer teach etiquette or how to write a letter. They are not taught to introduce their friends to their parents or when a thank you note is appropriate. Civility is at the bottom of the required skills list. Teachers didn’t make the rules and probably dislike them more than anyone although they have to abide by them. This just might prove interesting. But since it DIDN’T end, what are the real implications? The news media’s relevance continues to decline for reporting one more inconsequential and irrelevant story. Sales of Mayan calendars have plummeted. It doesn’t matter anyways – it’s now as useful as a paper calendar from 2005. People are scouring the Internet to find something else to worry about. I am pleased to report that our two cats were totally untroubled by the situation, and have maintained their daily quota of naps. So the world continues on. I’d write more, but the kids just came down and told me they’re out of clean clothes. It seems that “just in case” they didn’t see the need to take their dirty clothes to the laundry room.